UK challenger bank Tandem is reeling in more cash via a $15 million investment from Hong Kong-based Convoy Global. Along with the injection, they have formed a partnership. According to Convoy, this is the first-ever partnership between a Hong Kong financial services company and a UK “virtual” bank provider. Convoy’s strategy is to focus on the “transformational opportunities of fintech and businesses”, and the partnership with Tandem builds on its existing investments in Nutmeg in the UK and CurrencyFair in the Republic of Ireland. 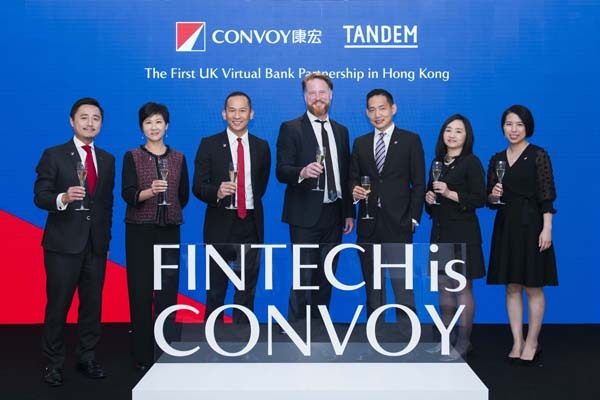 For both it’s a handy deal as Convoy plans to use Tandem’s tech to offer digital financial services to Hong Kong consumers and, in time, to launch a virtual bank, depending on regulatory approval and the grant of a banking licence. It’s all a big change from August 2017, when Tandem received an emergency cash injection of £3.6 million from its investors when a major funding deal with House of Fraser collapsed. Since then, it has moved on and made progress. It acquired Harrods Bank in January 2018, which brought with it £80 million of capital, a mortgage book and £400 million of deposits. This year, it also acquired money management app Pariti; reached 100,000 clients; and last week partnered with payments provider Stripe to power its new auto savings service.